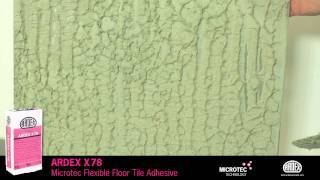 ARDEX X 78 is a high performance, fibre reinforced, polymer modified floor tile adhesive, which has been specially formulated with Microtec Technology to give exceptional properties of adhesion. When mixed with water, an extremely smooth, creamy, pourable mortar is produced which easily enables full coverage to be achieved on the back of floor tiles. 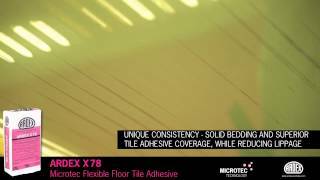 It also has double extended open time and non lipping capabilities, making ARDEX X 78 the only choice for heavy, large format floor tiles. Fully vitrified and ceramic tiles, porcelain, concrete stone tiles e.g. terrazzo, natural stones (excluding moisture sensitive), glass and porcelain mosaics.